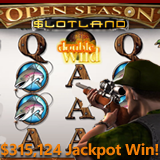 A stay-at-home mom hit the jackpot at Slotland last week, winning $315,124 on one spin of the hunting-themed Open Season slot. She broke casino records by winning the largest pay out ever for the casino’s frequently-hit site-wide progressive jackpot. Debra J won over $315K playing the Opan Season real money online slot game.